In the Gospel on the last Sunday in Advent, Joseph was to welcome Mary and her Child into his home and name the Boy. Today, we see he did much more than that. St. Matthew tells us that after the wise men, who had come from the east to worship the newborn king of the Jews, departed from his home, Joseph had another angelic visit. In a dream, an angel warned him to “rise, take the Child and His Mother, flee to Egypt … Herod is going to search for the Child to destroy Him.” Imagine these parents getting a warning like this after what must have been an utterly remarkable visit from those wise men. When Joseph and Mary saw the lavish gifts and the deep reverence from strangers who had traveled so far to find them, did they fill with sweet joy over this Child’s future? The visitors had been aided all along their journey by a bright star in heaven. Earlier, angels had appeared in the sky directing shepherds to find and adore the Child, too. They must have been so confident of God’s involvement in this drama. Nothing seemed impossible for Him! Now, Joseph gets this dire word of great, immediate danger. 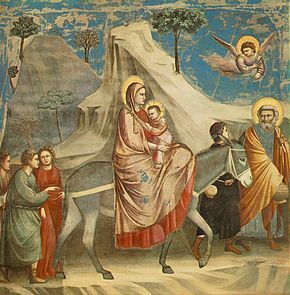 He had to awaken Mary and give her the grim news in the middle of the night: “Joseph rose and took the Child and His Mother by night and departed for Egypt.” How heavy was the weight Joseph felt on his shoulders that night? How many questions did he have to leave unanswered? Did he wonder, if God could move the stars in the sky and fill it with angels, why couldn’t He protect this miracle Child from a murderous king? Did he question why he should bother to believe in miracles if, when he really needed one, he didn’t get it? Did Joseph and Mary talk about these things in the darkness as they quickly, stealthily slipped out of town? We don’t know all that we would like to, but we do know that Joseph listened to the angel’s command. Why did the angel appear to Joseph rather than Mary? It was because Joseph was the true head of this tiny family, not a mere figurehead. The responsibility for their well-being was given directly to him. We find that, unbeknownst to Joseph, this escape to Egypt was actually all part of God’s mysterious plan. It’s not that God directed Herod to try to kill Jesus. God knew he would do so out of jealous rivalry (as the Serpent tried to do to Adam and Eve in the Garden; as the Jews later did to Jesus on the Cross). The family would, for now, find safety in Egypt, a frequent place of refuge for Israel in the Old Testament (see Gn 12:10; 46:4; 1 Kings 11:40; Jer 26:21). There were also, at this time, large colonies of Jews living there (i.e., in Alexandria, Elephantine). When the time came for the family to return, that would fulfill an ancient prophecy of God’s Son being called “out of Egypt” (see Hos 11:1; Ex 4:22). It referred first to the nation of Israel, whom God called out of the darkness of slavery there under Moses’ leadership. It refers now to Jesus, Who will lead His people out of the darkness of sin and death to the new Promised Land of heaven. This is a striking lesson about the nature of fatherhood, one that seems particularly important in a time like our own. The Church’s call to observe the Feast of the Holy Family is a constant reminder of the order God has created for families. Fathers are important! We have such rampant fatherlessness all around us that we can’t hear this message often enough. Many of the cultural taboos that once kept the notion of family structure in place are now gone. Even in families with both parents, fathers can, for a variety of reasons, forget that the responsibility for keeping their families in God’s plan falls to them. What better way for the Church to begin a new liturgical year than to hear afresh how healthy families function. The future of the Church and of society begins in the family—yours and mine. This is the first great fruit of the Incarnation. It should give all of us hope. Possible response: Heavenly Father, thank You for all earthly fathers who willingly embrace the work You have given them in their families. Give them Your grace today.